John Zagrodzky presents at the Darien Town Hall on Dec. 11, 2017. So stated First Selectman Jayme Stevenson during the state of the town address. 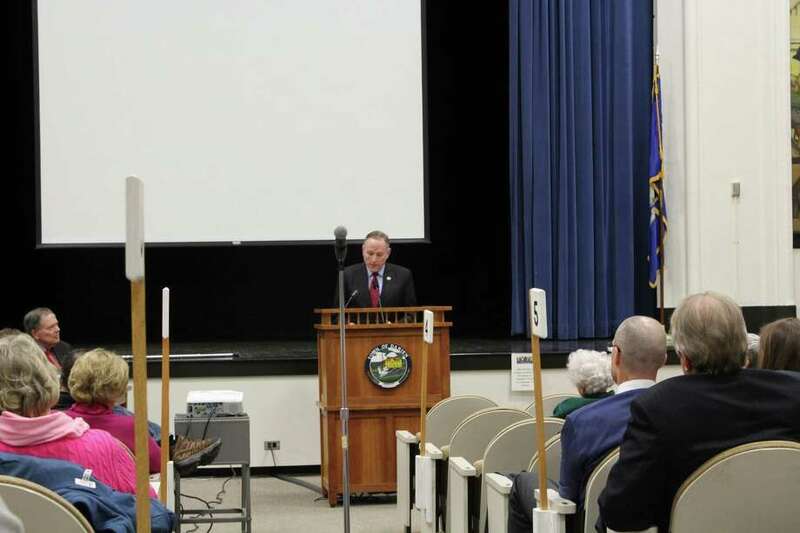 She and leaders from the Board of Finance, Board of Education and the Planning and Zoning commission discussed the upcoming fiscal year and outlined a vision for a long-term plan in the annual state of the town address Monday evening in the Town Hall auditorium. With state reductions on tax reimbursements and increasing demands for money to provide for teacher pensions, coupled with federal cuts in property tax deductions, local residents are preparing for higher taxes. Board of Finance Chairman John Zagrodzky presented both a baseline and alternative five-year forecast for the town. The alternative forecast accounted for two key changes: that the state would completely reduce their $2.5 million reimbursement for excess special education and that it would demand approximately $4.5 million to contribute to teacher pensions. Stevenson believes the town will continue on its trajectory of “fiscal self-sustainability against wild swings in state policy and changes in the federal tax code” with careful planning and fiscal discipline. Stevenson recognized that these measures will be difficult to achieve but that they are in the best interest of the town going forward.“We must be mindful of the compounding effect local, state and federal tax changes will have on Darien taxpayers,” Stevenson said. As first selectman, Stevenson has participated outside the town in regional organizations like the Western Connecticut Council of Governments and the Connecticut Conference of Municipalities, a municipal advocacy group. Her stance on regionally consolidated mandated services remains unaltered until potential savings for Darien residents are made apparent by regional tax assessors. “I’m a strong voice against mandated service sharing but believe cities and towns should be encouraged to voluntarily partner if they can pass on meaningful savings to taxpayers,” Stevenson said. With the anticipated zero percent increase in the budget, Zagrodzky said that any new initiatives may have to be stalled or rigorously analyzed in order to accommodate to the financial pressures. “Now is not the time to start programs or initiatives. Not to say the answer should always be ‘no’, but we should scrutinize any plans to start something new, whatever it is,” Zagrodzky said. Additionally, the amount of personnel employed by the town is unlikely to see any net increases in the coming year and departments will have to make very strong cases for new hires. Zagrodzky added that Darien retained a Aaa rating from credit agency Moody’s allowing the town to continue with the best terms when it comes to borrowing but work will still need to be done to maintain this standard. Preparations for additional costs brought upon by the state government in the current year were accounted for in projections, resulting in lower than expected costs. “We actually planned this in case we faced some costs from the state, so this gives us a little breathing room for these two years,” Zagrodzky said. The town’s debt is in “pretty good” shape according to Zagrodzky. The notion of “no major school projects”, however, will be challenged in the coming years as discussions and meetings regarding this topic have not reached a final proposal for consideration by the boards. Fiscal year expenditures on education have increased from 60 percent to 66 percent when compared to 1990 and may continue to grow. Zagrodzky made clear what investments should be prioritized at a time when low-interest rates favor the town due to its stellar credit rating. “I’m personally not supportive of considering other major capital projects, like those envisioned in the very expensive sounding Parks Master Plan, until we have potential school investments sorted out,” he said. New residential developments and the town’s education system bring in families and thus a growing population of student bodies said Board of Education Tara Ochman. Development projects are hoping to attract new residents to Darien, according to Planning and Zoning Chairman John Sini. Projects such as the Noroton Heights Shopping Center and The Commons at Noroton Heights, expected to break ground in spring next year, will provide a total of 181 one and two-bedroom units. “This significant increase should attract empty-nesters, young professionals and Metro-North Commuters to the area,” Sini said. Infrastructure improvements are also expected. The P&Z commission worked with traffic experts to improve traffic and pedestrian movements on key streets such as Noroton Ave., Noroton Heights and Hollow Tree Ridge Roads. “Not only will these projects bring beautiful pedestrian-friendly developments with several open spaces, they will also deliver much-needed infrastructure improvements to the area,” Sini said. Sini also addressed the impact brought about by e-commerce retail on traditional brick and mortar shops. “The commission is working closely with our commercial landlords to foster vibrant business districts,” he said.